Putting on a Side Show. Do you have a shameful secret? Something you’d rather keep hidden? I am, of course talking horticulturally here…. what ever else? 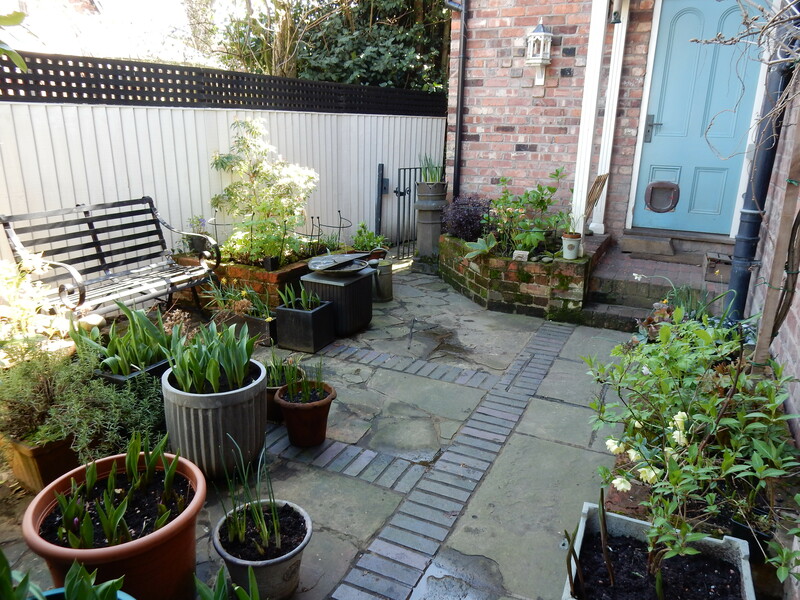 There we were, around my kitchen table, discussing various class members’gardens and I realised that we were all happy to talk about our fronts and rears ( I’m still talking horticulturally here....) but then went very quiet when it came to our sides. Now why was that? Probably because our side passages are either dumping grounds , draughty access points or dark wastelands that we have no idea what to do with. Sound familiar? A show of hands revealed that many of us had doors or windows that looked out onto these grim side scenarios so I decided that, this week, we needed to brave the cold and go on a nice ‘side site visit’ to see just what could be done to improve matters. Raised beds to bring planting up to a height where they can be seen from the window. Raised beds also soften the fences and walls, and keep the dogs from digging up the plants! Planting is key to making this small area look and smell good.Sharon is an artist and loves overscaled plants ( I often have to restrain her from planting yet more trees) and moody colours so there are black Hellebores and Queen of the Night tulips for later, with bruised purple Alliums and delicate handkerchief petals of Anemone ‘White Swan’ with its purple undersides. She’s also planted some lovely standard hydrangeas in the raised beds to give height without shade ( clever because she can plant underneath too). Sharon said, ” You can come and see my side on condition that you prune them for me.” So, after a big group discussion about where to make the first cut, they were soon in a neat lollipop shape again. And I put in this false window mirror with shutters opposite the kitchen window. The client thought I’d cut a hole in her wall, so realistic was it!!! No more side issues here. Incredible results! Love reading about your work though I have just a few pots for a garden. Haha, glad it was inspiring! Now I want to get outside and work on my side entry area!! Thanks for the inspiration!